About ProcessWire Weekly – what's going on and how did we get here? ProcessWire Weekly is a series of posts about the ProcessWire CMF/CMS. Our recurring weekly posts have been introducing new features, modules, sites, and various community projects and events for years. Inspired by the Responsive Design Newsletter, also known as Responsive Design Weekly, ProcessWire Weekly started out as an attempt to provide regular updates about all the things happening around and within the ProcessWire CMS/CMF. The first issue of ProcessWire Weekly was published on Saturday, 17th of May 2014. Back then ProcessWire had already gained enough momentum to make keeping track of it all quite laborious This was the spark that led to the first issue of ProcessWire Weekly, and the positive reaction from the community was the fuel required to keep it going. Since our first issue in May 2014 we've published a new issue every single Saturday, and will continue to do so for as long as there's a demand for such posts. As of this writing, we've already got well over 60 issues out there, and so far there's no end in sight. What started out as an unofficial experiment is now tightly integrated with the official communication of the ProcessWire project. For this we have none other than the lead developer of ProcessWire, Ryan Cramer, to thank for. In addition to being quite prominently featured at processwire.com, our content is also used as the basis for the official ProcessWire newsletters. These, in turn, get sent every week to a growing number of subscribers. In August 2015 ProcessWire Weekly took another step forward when its own, dedicated website, weekly.pw, was launched. This seemed like the obvious next step: ProcessWire Weekly is already a notable entity of it's own, and as such deserves more weight than a tag applied to a bunch of blog posts could carry. ProcessWire Weekly is a non-commercial project maintained by Teppo Koivula. The lead developer of ProcessWire, Ryan Cramer, is the man behind the ProcessWire newsletters, and his weekly posts at the official processwire.com blog remain an invaluable source of information and inspiration. We're always happy to receive contributions, suggestions, and all kinds of feedback from our readers. You're the sole reason this project continues to exist, and we're grateful for your continuing support for us and ProcessWire. Thank you! ProcessWire is an actively developed open source content management framework (CMF) and content management system (CMS) with a growing number of users from all around the world. 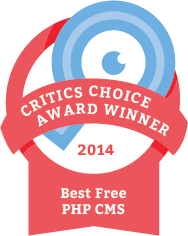 CMS Critic hand-picked ProcessWire as the Critics Choice Winner for the Best Free PHP CMS back in 2014. Built with flexibility, ease of use, and security in mind, ProcessWire provides a combination of simplicity and power for all types and sizes of sites and applications. From modular architecture, custom fields, and jQuery inspired API to easy-to-use admin backend GUI, every little detail is designed for the needs of modern web development.